The LoD Signature Series Mid-Width is constructed of 3/16" steel. 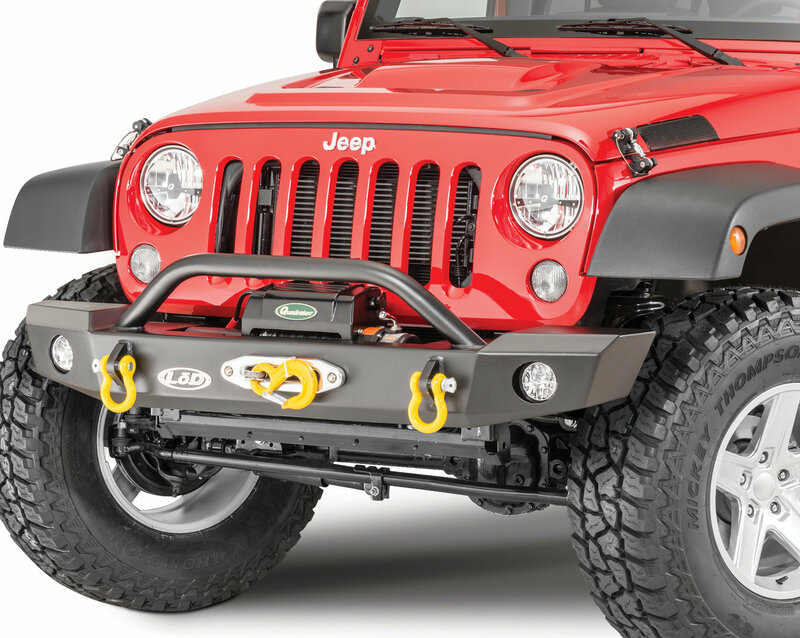 The bumper includes two clevis mounts and comes standard with a winch mounting plate. The winch mounting plate is constructed of 1/4" steel. 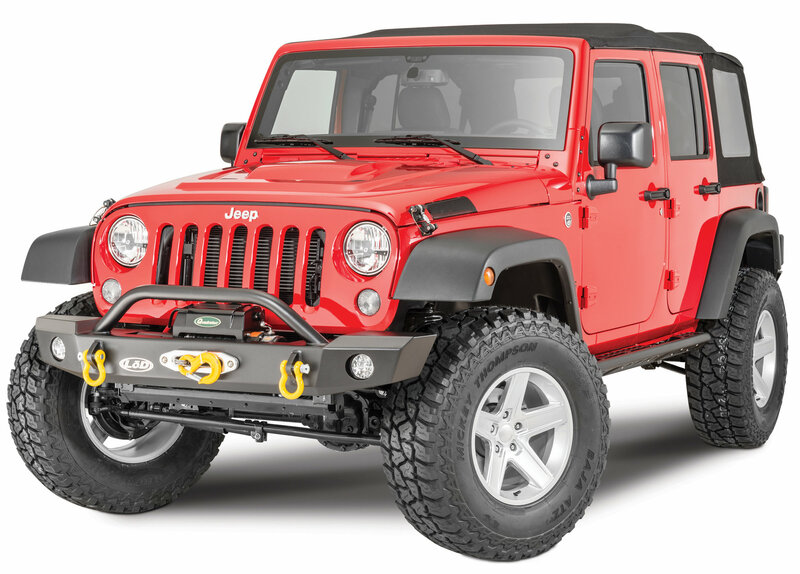 All Signature Series Bumpers includes provisions for the factory fog lights and are available with a fully welded bull bar or without bull bar. LoD products carry a limited lifetime warranty against mechanical failure and a 1 year powder coat warranty. Made in the USA. For use with Warn Zeon Winch Only. Manufacturing was pretty fast. I was told 3 weeks and they delivered in 2 and a half. I like the look and features of the bumper. If this was made with closer attention to detail, it would be a great bumper. There are a few parts where the paint was scraped off. QC should have caught this. The instructions aren't great. They are adapted from the shorty bumper. In step 6, don't try to access the 4 inside nuts on the factory bumper from below. Just take off the top plastic cover and do it from the top. It will save you 30 minutes of bending your body in ways it wasn't meant to bend. I drilled out the screws on the plastic top, then just slid it to the side to gain access. If you have a Warn Zeon winch and a 2012+ jeep, cut off the vacuum bracket more than the picture shows in step 4A. It's not enough. The winch won't fit correctly. Cut it as far to the right as you can get. The 4 inside bolts in step 18 is crazy hard they way they say to do it. The instructions for this step are for the shorty bumper (which looks so much easier). After an hour of swearing and having 4 other guys try to help, I called in to LoD. I was very calm and friendly, but the guy sounded annoyed at first. He stated that they sell thousands, and everybody gets them on. He said it would take him a day to send pictures. I eventually figured out that if you flip the bolts around it's MUCH easier. You need to purchase fog light cable extensions. The factory wiring isn't long enough to fit the new fog light locations. It didn't mention this anywhere in the instructions. I have a 2016 JKUR and I have no idea how to install the lower 2 bolts on the skid plate. It's not like the pictures in the instructions. The sides of the lower cross member on my jeep are closed off. In the picture it shows them as open and easily accessible. There is also half a large hole on the passenger side where it says to drill a 1/2" hole. Don't try to get a deal from LoD on this. I called in to see if they would price match online stores and/or offer a discount if I picked up from them. After waiting for a few days for a response, all the online stores pricing jumped back up to their recommended pricing and they responded with a "deal" for pickup that was around the same pricing as ordering it from online stores. It ended up being cheaper to order it from Quadratec and I had it shipped straight to me.